An eight-year-old boy from Guatemala has died in US government custody, immigration authorities say. It is the second time this month an immigrant child has died while being detained after crossing the US-Mexico border. The previous instance saw a seven-year-old girl, also from Guatemala, die hours after being taken into custody. US officials said she had tried to cross the Mexico-US border illegally with her family. The Guatemalan girl, who authorities there named as Jakeline Caal, died of dehydration and shock, the Washington Post reported. Border officials were quoted as saying she had not had food or water for several days. 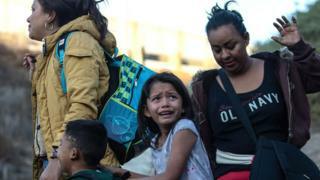 The migrants say they are fleeing persecution, poverty and violence in their home countries of Guatemala, Honduras and El Salvador. What happened in this latest case? The boy died shortly after midnight on Christmas Day, US Customs and Border Protection said. In a statement, the agency said the eight year old had displayed “signs of potential illness” on Monday. It reported that he and his father were taken to a hospital in Alamogordo, New Mexico, where the boy was diagnosed with a cold and a fever, given prescriptions for amoxicillin and ibuprofen, and released on Monday afternoon. He returned to the hospital on Monday evening after he began vomiting and died there just hours later, the statement added. The agency said the cause of death had not been determined, and that the Department of Homeland Security’s inspector-general and the Guatemalan government had been notified. It’s been running high since the arrival of thousands of migrants in recent weeks. President Donald Trump has vowed to keep each migrant on the Mexican side of the border until courts have decided their cases, meaning some face a long wait.